Cryptumcoin (CRYC) is a secondary project, funded by 5% of the Cryptum ICO. Together with Crypto Mining Blog we are developing a new mineable cryptocurrency to use in loyalty and payment system of our future games store and services offered by additional projects we start under the Cryptum brand (for example, it would make a great currency for paid advertisements on a news or ICO-related website, as we already have some preliminary plans for such activity). The development of Cryptumcoin normally raises the question why we didn’t add this functionality to the Cryptum tokens instead of releasing another digital currency. 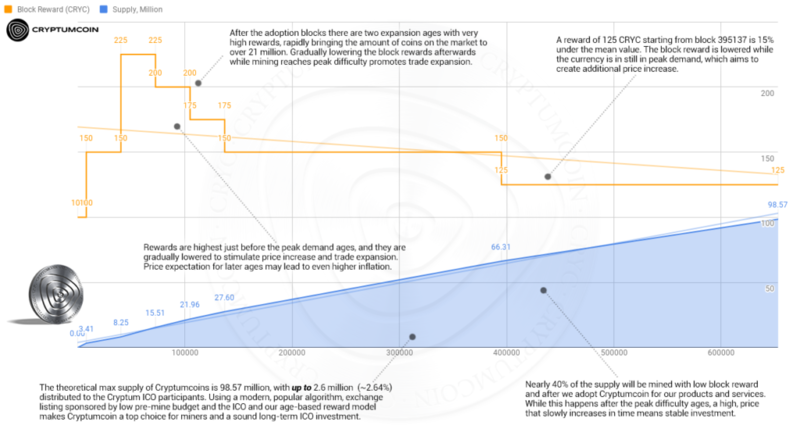 The Cryptum Tokens (CRTM) would not be widely accepted at all exchanges, especially the US-based, and their specific features revolve around their sale cost and are tailored to the prospect of keeping them as a long term investment; turning them to a form of a currency would allow us to simply remove them from the market and make them non-accessible (except by buying them from exchange), and their number is already low to begin with. In addition, we need a currency with much higher spread and capitalization, one that would be accessible to everyone not only by means of trade, and this is something we couldn’t bestow on the limited number of tokens we are using for the crowdsale. Last, but not least, the Cryptum Tokens are already expensive, and have a great number of features, adding one more that we only have in a distant planning stage wouldn’t make them much more attractive. At the same time, creating a new cryptocurrency that would be marketed through the Blockchain board game, accessible and attractive to miners, and used in our ecosystem or even our partners’ systems, gives us a chance to create a lasting cryptocurrency that have use outside the typical exchanges trade, and promote services that actually anyone can afford by mining (or buying the coins off exchange), while initial amounts from it are still available to all Cryptum Token owners. (Note that all information dependent on the amount of CRTM sold during Stage I is non-final. We will keep the ratios and final amounts as close as possible to the information below, but some calculations use the CRTM sold during Stage I and we are compiling it before its end). In order to promote the change for the Stage II Sale, we will be distributing much higher amounts of Cryptumcoins during their launch in December. 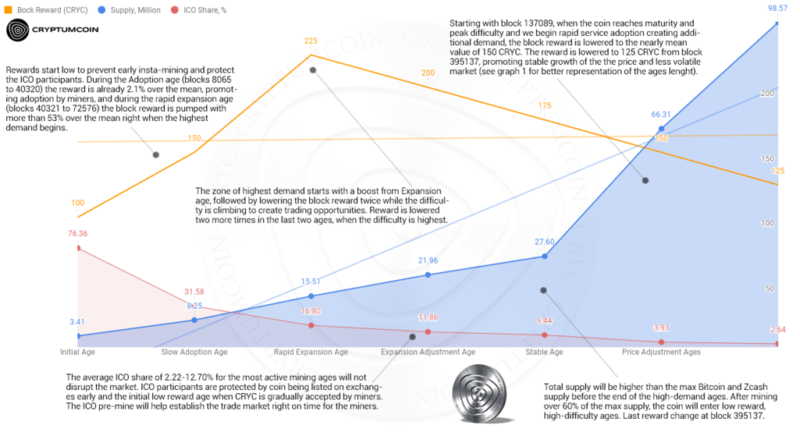 Launching a currency that has both a fair launch targeted at miners and a large pre-mine, which are somehow mutually exclusive, is not easy, but we found a way to balance between the ICO supply and the coin effective supply (the supply in the most active mining and trade periods we call “ages”, see the table below) and the max supply. We are keeping the total pre-mine to between 0.42% and 2.64% of the max supply of Cryptumcoins (depending on final ICO sales) and between 2.22% and 12.70% of the ages of peak interest supply. If we sell a total 35 000 CRTM with 5% bonus on the amount sold during Stage II, we will distribute 35 760.88 CRTM to token owners, and, after the Cryptumcoin launch, any owner would be able to claim 10.58 CRYC per token (for a total of 578 387.35 CRYC, representing less than 0.6% of the theoretical future maximum supply of Cryptumcoins). Additionally, in this example, after the claims, we will distribute 22 703 bonus CRYC via aidrops to TOP63 contributors (355 each), we will have 11 351 CRYC for bounties (note that social bounties will only be distributed if we sell more than 55 000 CRTM total) and 177296 CRYC budget for exchanges listing. Not in the table – we will have a bounty campaigns, distributing an amount equal to 50% of the post-sale bonus, but these will be announced after the Cryptumcoin pre-announcement. You can also follow the Blog section for more information and updates about Cryptumcoin.